As we are in the recovery stages of this horrible storm mother nature has blessed us with.. Here comes Halloween. Or is it the other way around, as we were preparing for Halloween here comes this storm. I happen to live in staten island, by where many people have lost their homes and lives. Our home was hardly effected besides a fence and electricity for a while, but we do have family staying with us because their home was practically under water. We are so happy and blessed to have been able to help them. I say that we are happy to help and some may not understand, but for me I will always help someone that is working so hard that help is needed. I have seen the looks on their faces of exhaustion after cleaning and salvaging whatever they can… I could imagine it being very hard. 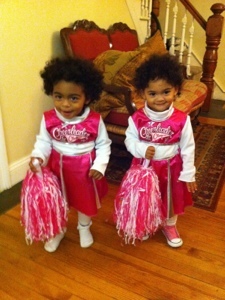 However I did dress the girls for Halloween. we are blessed to all be alright and I figured we would visit their greatgrandma in the nursing home to put a smile on her face and boy did they. All of her friends gathered around to see the girls pom poms go. Back in our neighborhood we took a walk around but it didn’t feel the same. I had one neighbor come out their home with treats to say that we must go on because we have to keep the children happy.. Not to take the cheer out of Halloween.. But what about the people that will remember this day as a tragedy We shall see what next year brings. How do you feel about this tragedy and the effect it may have on Halloween for new Yorkers?